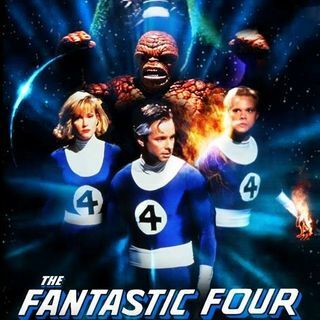 This is Rebel Scum Radio's audio commentary of one of the worst (and in a way one of the best) super hero movies of all time - Roger Corman's 1994 The Fantastic Four. Simply start watching the movie from one of the YouTube link below at the conclusion of the intro music and adjust sync as required. Unreleased to the public and now a cult classic it is up there with our favourite 1970s Hong Kong Spiderman movies and 1988's Incredible Hulk ... See More Returns. "The story of the film goes back to the late '80s when Marvel Comics were licensing out their characters for mild profit in a time when the comic industry was failing. Enter a German company called Neue Constantin and producer Bernd Eichinger, who held the rights for almost four years before their contract was about to run out. In order to retain the rights to future remake/options and get out of paying a five-million-dollar fee, Neue were forced to put something to film, so they made a deal with Roger Corman's New Horizons studio to make the film quick and on the cheap for $1.5 million. Once the film was finished, Eichinger bought out Corman's interest, then turned around and sold it to 20th Century Fox, who were then prepping a $50 million adaptation with director Chris Columbus. The film then dove into virtual obscurity, save for the comic convention bootlegs and later through the internet. The storyline follows the basic framework of the comic, with the exception of a few minor details, including the introduction of a new villain, The Jeweler, who directly becomes responsible for the team's mishap in space and takes liberally from another one of the comic's famous villains, The Mole Man. In reference to its underground popularity, Corman now regards it as his most profitable film that never saw release, while Marvel president Avi Arad reportedly burned Fox's only print." There was also a documentary made about the film in 2015 titled "Doomed: The Untold Story of Roger Corman's the Fantastic Four"